This article will start our feature on affordable wines that you can get in your grocery store: Costco, Cost Plus World Market, Trader Joes, or Bevmo. I have to say that this is my favorite recent find and my new go to wine if I want to drink something at home that I don’t mind opening for just me, or to share with friends for an easy impromptu night. I am unsure if sharing with The Brit counts. Usually, when I do drink at home just by ourselves it is a rare thing and I don’t like to share. (Okay, he gets one glass.) It’s all about ME! However, the rule is his wine is also mine, if I am in the mood to have a sip. Funny how that works right? We are members at Rutherford Hill Winery, but they don’t sell this wine at the winery. This is their retail product. I found it by accident during my recent trip to Chicago. Yes, I did go all the way to Chicago to discover a Napa wine. There is a story to this! I went to Chicago to help one of my best friends move into her dream home. I flew with my bags laden with a case of hand-selected wine from my favorite vineyards for us to drink. But disaster hit! The wine got accidentally packed in the shipping container before we could drink but a few bottles. That left us with no wine! I am sure you can all appreciate after a hard day of packing and moving boxes, a girl needs a glass or five of wine. The next day we went to a local Sam’s club and this Rutherford Hill Merlot was on offer for $18.99 per bottle. I bought a few bottles to try to ease our wine sadness. A new love was born! I want to point out that I am no huge fan of Merlot in general. I don’t tend to buy it because it has become very bland over the years with people trying to mass produce it and not doing a very good job. What you end up with is a kind of tasteless red that isn’t offensive, but doesn’t do much for the yumm factor either. In that case, why bother? 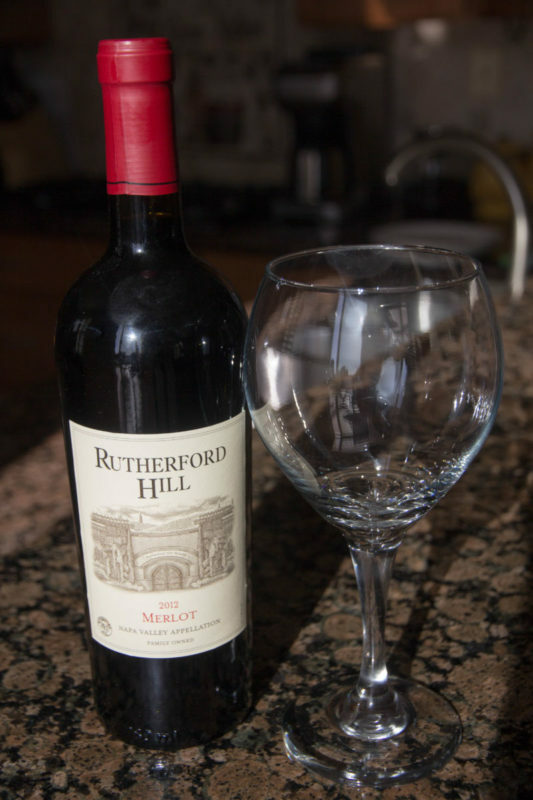 Rutherford Hill is a winery which really specializes in Merlot. Their blends are outstanding and they are my current favorite winery of any I have tried in Napa Valley. I am particularly fond of their Peak series, but those are in the $60 range. Not something for an every-night sip for average Joes like you and me. So what is it about this Merlot that makes it great? First you have all the smell that you would get from far more expensive bottles. Rich and lush fruit comes to your nose. There is a soft spice there too that takes it beyond just a nose full of jam. The flavor is wonderful, full and round with a very smooth finish. 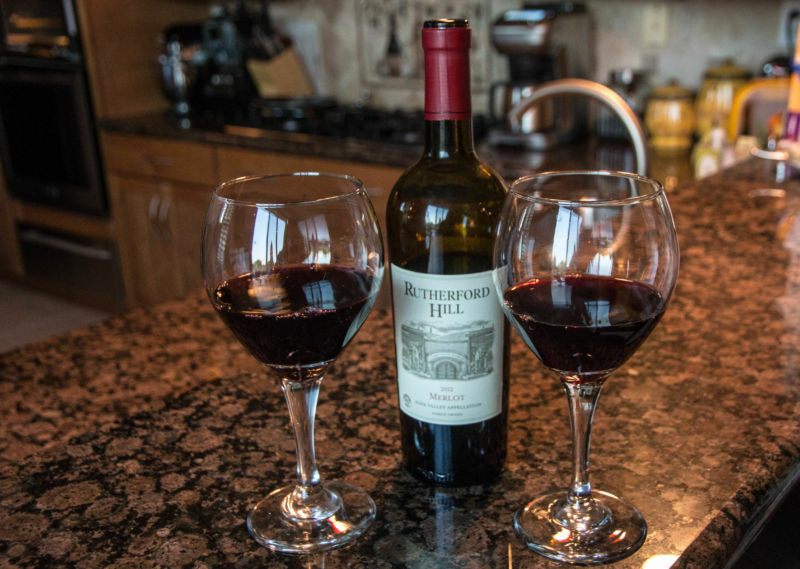 This wine would pair with most food, though I wouldn’t put it with a big pasta or curry dish. This would do great with anything from a burger to a veal piccata. It is also great with cheese, crackers and fruit or just on its own. After consuming a shameful amount of this lovely wine in Chicago with my girlfriend, I called The Brit who was in California to tell him of my discovery. He, of course, couldn’t trust my say so and had to try this little treasure for himself. Let’s just say he ended up buying our local Safeway out of their stock on the shelves. His excuse was that if you buy 6 bottles you get a further discount on their already low price. It brought the price down to around $15.75 per bottle; I think that is a deal! He did see it at Bevmo for $19.99. I am told that Raley’s does good deals on wine too if you buy multiple bottles so check there for their price. The Brit comments: In fact I bought Safeway out twice. On my first visit there were just two bottles on the shelf. I made up the half-dozen needed for the discount with four other bottles. A few days later, I checked back and they had six bottles, so I took them all. On our recent trip to Tahoe, we forgot to take any wine with us. We purchased and drank two more bottles from the local Tahoe Safeway. This is definitely our current sub-$20 go to wine. We did find a bottle of the 2011 of this wine at BevMo, but it lacked the full and perfectly balanced character of the 2012. If you need a wine to take to someone’s house and you don’t know what they drink and don’t want to spend a bunch of money, this is a great choice. They will never know you didn’t spend a fortune. Shhh! I won’t tell if you don’t.